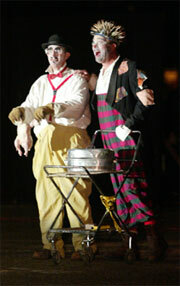 The Cirque de Flambé is thrilled to offer opportunities to share our skills. 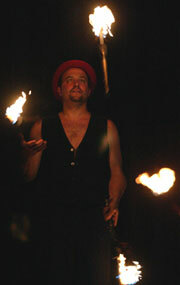 For 2005, we've got two series of skill workshops; Monday fire safety training, and Thursday prop skill workshops. 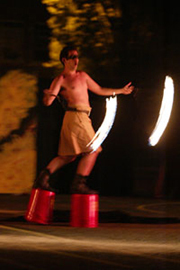 Fire safety is an essential element of every performance and practice. With this summer long series students will learn, backstage and prop safety as well as performer safety responsibilities. This series is required for all new members of the Northwest Fire Conclave, is open for your group training. We feel fire safety is so important we're offering this training series for free. Learn more and sign up by emailing our workshop coordinator. Location and dates to be announced. Oh the fun stuff we do! With all of the trained professionals we have in our fabulous volunteer circus, the workshops and classes we can offer are all too much fun! Sign up by emailing our workshop coordinator, or just drop in. New Schedule to be announced.